People with the Yang Wood Master Element mimic sturdy trees with deep roots that allow them to stand firmly in place. Just like those trees, these people could withstand almost anything which is also the reason why they can be very bull-headed and persistent in getting what they want. Just like the way trees don’t fear growing in any direction, Yang Wood people will talk to you in a direct manner. Since they are not disposed to sugar coating their words, they are sometimes viewed to be too blunt and thoughtless even if they didn’t mean to insult anyone. These are the type of people who always act as the right hand because they can be trusted and they are very protective and loving of the people they love. Even if they often end up as runner-ups, they don’t hold grudges as they are loyal people who wouldn’t give up easily. Yang Wood people are the type who could visualize the grand scheme of things and pinpoint the major factors in a particular issue. But it is also because of this mentality that they tend to get directly to their end goal without thinking over the smaller details which give them a tendency to be frivolous especially in making decisions. When called upon to make a decision, Yang Wood people do so without additional prompting which leads to hasty decisions that do not consider all facts at hand. These people make decisions as a reaction which can be dangerous since they are hesitant about rethinking or correcting any of the decisions they made even if it is obvious. Yang Wood tends to grow long and strong roots at a place where they live or work, therefore they often hesitate to move. Changing a job or place of living can be extremely stressful for them and they might avoid it no matter what. Yang Wood people see things based on their beliefs and experiences and they find it difficult to be objective about the way they see things. Although they may ask for the opinion of their friends and family members, it is mostly because they want someone to agree with them rather than to ask for advice. Given their ability to articulate their thoughts easily, people under the Yang Wood sign would do well in the teaching profession. But most of the time, they cross the line from teaching to criticizing and this makes other people see them in a bad light. They place so much importance to their careers that it defines who they are. They are willing to stay employed even when they are not paid a lot as long as their position has a prominent and influential status. These type of people need to feel that they have an elevated financial status to be more confident since they do not bank on having sharp minds. At the same time, they have a sexual nature and this prompts them to dress up to feel good and have greater self-esteem. Most Yang Wood people are not very religious because they would rather stick to what they believe, and they are only confident when things are going well. Once they suffer from setbacks that seem to push them down, they are prone to losing their confidence. Yang Wood people do not get angry easily as they see it as a means of losing control but there are instances when they become angry because things are spinning out of their control. The same way that a tree could stand firm in the middle of a storm, they could also be prone to be blown in all directions and in this case, it is vital to step out and look at the bigger picture to keep things in perspective. Yang Wood is strong if born in the winter, and prosperous if born during the spring season. During summer and autumn can be rather weak. The tree needs regular trimming, therefore Yang Metal and Yin Fire are the most needed elements, especially if Yang Wood is strong. Yang Fire and Yin Water are also highly beneficial for this Master Element. 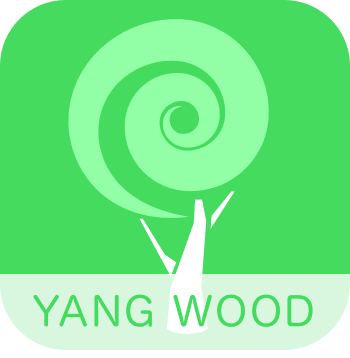 Yang Wood is rather sensitive, and when it comes to elements support, they need a lot of conditions to function properly. A tree needs sun, to provide warmth, water to provide nutritious, strong earth to provide stability and strong metal to perform regular trimming. In featured characteristic, we point out some special issues which are essential to understand and deal with Yang Wood people. At a workplace, it often feels like Yang Wood is not doing much, but the tree has one very important function, and that’s providing oxygen, so their work often goes unnoticed, to those who don’t look carefully, but once they are gone, it will be greatly missed. Yang Wood often have a problem that they can’t be on the top for too long, for example in a company, certain market or profession. Like the tree which grows too big, it needs to be cut down to give space to other plants, therefore they are excellent in right-hand roles. If you look at the list of famous people below you will notice that almost all of them struggled to stay on top of their game. Many died early, while many struggled with addictions. Some, like Andy Murray, couldn’t get on the top regardless of what he did, he was always overshadowed by two or three other players. It will be interesting to see how Elon Musk will cope with success if he becomes a leader in electric cars industry. Gallbladder, head, scapula, thyroid, nervous system, ankle, fingernails, and toenails. A balanced Yang Wood person will have a healthy gallbladder system and strong life energy. Excess Yang Wood indicates that the person will be susceptible to thyroid problems, inflammation of the gallbladder, or migraine headaches. Deficient Yang Wood suggests the person will tend towards weakness in gallbladder function, gallstones, inadequate immune system response, neurological problems, or ankle pain. The mighty tree rises, connecting the earth and heavens above. He does not like to move or change anything around about. Slowly seeping in to add fluidity and promote his great strength. Minerals enrich and nourish his essence. Adding strength and foundation to conquer all. Indeed the great provider for all living breath. All around can enjoy his bounty and harvest. He shies away from any legal challenge, quivering from the sharp axe threat.